Co-published in association with NADE. 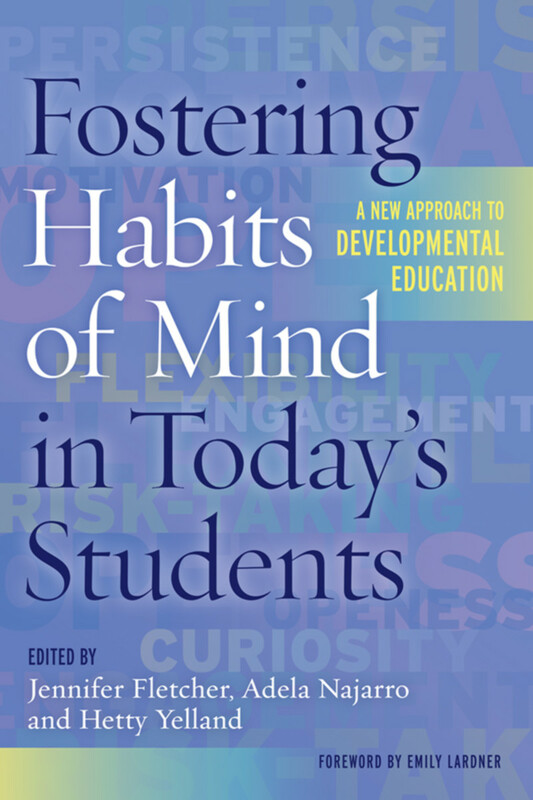 “Fostering Habits of Mind in Today’s Students is an edited volume that promises a new approach to developmental education. Rather than focusing solely on how to teach content, it provides model lessons aimed at fostering holistic intellectual growth in students of diverse range and background. The book consists of research-based articles and lesson exemplars. The editors acknowledge in the preface that their intention was to create a practical book that would be useful to fellow educators. Their experiences as developmental faculty members led them to collaborate with 13 colleagues, supported by a Lumina Foundation grant, to develop a resource to address students’ intellectual growth through improving engagement, persistence, motivation, and self-efficacy. Described as a “new approach to developmental education,” their work will likely appeal to a variety of educators. Classroom-ready lesson plans are featured in each chapter, and they follow the semester-long trajectory of developmental courses through the first weeks when students and instructors are getting to know one another, mid-term slumps, and the push toward final exams and projects. The inclusion of plans and activities in this manner provides the reader with an immediate ability to implement techniques, which is a particular strength of the book. I found the book to be compelling and informative; gently offering reminders about the importance of refining one’s craft as an educator. Each chapter includes references and research cited, which serve as encouragement, an invitation, to explore concepts related to habits of mind. The combination of detailed references to scholarly research and specific applications of techniques allows educators to use the book to improve their teaching through a direct connection between theory and practice. "Whether you have been teaching for years or have just started your teaching career, this is a wonderful resource that offers practical, engaging insights and ideas for both you and your students." "Innovative, engaging, and cheerful, this highly readable book invokes the spirit of Mina Shaughnessy in its positive regard for developmental writers. The authors make a powerful case against a 'deficit-based' view of developmental instruction in favor of a long view that values each learner’s unique gifts, intellectual capacity, and potential for growth. The theoretically grounded and effectively scaffolded chapters are loaded with class tested assignments for teaching the 'habits of mind' needed for college and job success. A collaborative effort of fifteen veteran teachers of developmental English and math, this must-read book will help any teacher create a transformative classroom that promotes engagement, curiosity, motivation, risk-taking, self-efficacy, and persistence."